I am mulling on the current 3G network which doesn't give much room to the MPLS technology. 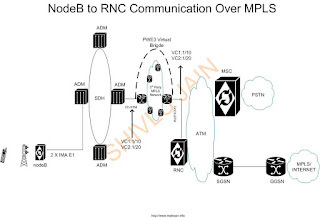 But MPLS could be used to delivery nodeB traffic to RNC over MPLS cloud down the year. In the depicted figure, 3rd party MPLS network is used instead of single aggregator router. By adding 3rd party MPLS network or own MPLS network; providers can get the benefits of Traffic Engineering, QOS and Fast Reroute. The PWE3 again plays a vital role to deliver the services over MPLS cloud. MPLS will be fully utilised once the provider's TDM network will be migrated to pure IP/MPLS network and at that time RSVP tunnels, RSVP tunnels QoS, Auto generation of RSVP of tunnels using Link affinities can be used. Provider will definitely upgrade to IP/MPLS network sooner or later. The easiest way to do so is by having an IP enabled device near Node B and then all the MPLS utilities can be used easily. In Metro ring we are planning to use RSTP (as our switches not support ERP-ethernet ring protection yet). But practically RSTP link loss failover time is around 2/3 seconds. then what will happen for the real time traffic like 2G/3G GSM traffic? For voice traffic, I guess an outage of less than 300 to 500 milliseconds may be required; otherwise, voice services will be seriously affected! What is the actual link loss fail over time for 3gpp standard and also for practical IP network which carries 3G traffic?! Sorry Dear Shivlu, I have spelled your name wrong in previous comment. Actually I have been following your blog for some months and you & ur blog become very close to me. Thanks. For 3G ip backbone and access network should run MPLS...I am assuming your all BTS are on ethernet no more TDM networks. Voice networks drop the voice calls if the restoration time is more than 200ms. This is what I have tested practically. As per my suggestions, you must use cisco new series IP Ran product portfolio of ASR901 for designing IP Ran and use ASR9k or ASR903 for pre aggregation points. The product port folio gives the flexibility of using EVC architecture along with all advance MPLS/BFD features. Please check with your account team for RSVP feature set. Juniper is having lot of issues in terms of scalability & feature roadmap. I have now tested both the ACX and the ASR901 in my lab and seen the roadmaps for both. I would take the ACX from Juniper any day of the week. It has a far more complete feature set and the passive cooling is a great benefit. can you share the result and your thought process. I think both vendors are lacking some important features today but if you see the all out road maps they are not far away or missing. I must clarify that my usage for these devices is only partially for LTE backhaul. I also have my eye on the utility and rail markets with my evaluations. First important sticking point with both vendors is multicast. L2VPN back haul is never a preferred solution for anything so it is disappointing that both vendors are missing out here. The passive cooling is a HUGE advantage from my mind for the Juniper product. The extra 5C temperature rating is also nice but not a show stopper either way. BGP based L2VPNs offer distinct advantages over LDP based L2circuits which is a big deal for scalability, but also for survivability when you enter utility space to ACX wins here too. Policy based routing on the Juniper is as always far more flexible which is a huge advantage to my mind. Once you have used Juniper's policy based routing and class based forwarding, you will never be able to go back to Cisco (not just relevant to mobile back haul here either). From the pre-aggregation standpoint I do like the ASR903s hardware layout with total redundancy although I usually prefer two discrete devices at each location. I also feel the ACX4000 pre-aggregation is less relevant given the MX5/MX10 routers which provide signinficatly richer feature sets and would be my number 1 choice further back. Of course that doesn't play on the argument at the edge. 10G on the Juniper is a selling point but often not relevant. Essentially both products have their selling points but I find Junos much more flexible to design the network which is why I would pick the ACX over the ASR901 at the edge. And of course don't look at either product's datasheet for information... features are appearing so quickly they can fool you..